For my money the west tower of the parish church of Chewton Mendip is one of the most beautiful in this county of stunning church towers. * The tracery of the bell openings and the blind windows below them is well proportioned; the pairs of corner buttresses frame the tower superbly and turn into pinnacles with elegance; the crowning openwork parapet and corner pinnacles top the structure off well without being exaggeratedly large. There are plenty of small details (shallow niches on the upper parts of the buttresses and on the pinnacles, crockets, the tiny upright shafts that run up parallel to the upper pinnacles) that set the design off and that come over as finishing touches rather than over-elaboration. I’d say that this was pretty much as good as it got in 1540, the approximate date when this tower was finished. Pevsner reminds us that this showpiece in Doulting limestone is one of the tallest of the Somerset towers, as 126 feet (38.5 metres). The antiquarian Leland called it a “goodly new high tourrid steeple” when he saw it just after it was completed. No matter that, by then, Gothic structures like this were starting to look a bit old fashioned: the masons of Somerset had been building stunning church towers along these lines for the whole of the 15th century and for a few decades of the 16th they continued.† The one at Chewton Mendip dwarfs the church (yes, there’s a church there, attached to the lower part of it, but invisible because of the rich vegetation in the churchyard) but that is no doubt what the priest and parishioners there wanted. Perhaps they said that they liked elements in nearby towers¶ and wanted something similar but better, and that this kind of tower fulfilled exactly their aesthetic preference, their desire to honour God through the building, and the skill and flair of the builders at their disposal. It must have taken their breath away when the scaffolding finally came down. It probably still does today. 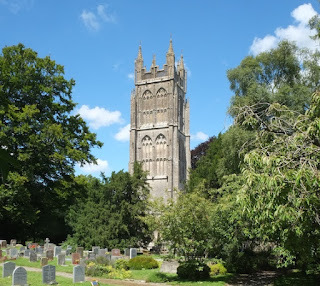 * I’ve posted about two other Somerset favourites: Huish Episcopi and Isle Abbots. † Wikipedia has a list of Somerset towers here. ¶ Some compare Chewton to Batcombe, but when you actually look at the two towers they’re not that similar. To an American eye, many European churches seem to appear unusually large in proportion to the number of persons they can accommodate. Assuming that Americans build for greater capacity, as I don't know we do, I suppose that this could owe something to the denser populations of the 18th and later centuries, when these churches were built. And if there is European tendency to make a great appearance, why not put the work into the tower rather than the church proper? George: Many thanks for your comment - always good to get a message from across the Pond. Many medieval churches look implausibly large for the populations they were designed to accommodate. The answer here is that they were built to the glory of God first, and to house a congregation second; it's nothing to do with population size, more to do with piety, and the financial resources to build on a large scale. Later churches (18th and 19th century) are more likely to have been built with a specific population size in mind. George -- as I understand it, at least in the 17th century, the congregation stood at church ... if you were infirm or elderly you were allowed to lean against the walls. So mentally take out the pews and see how much larger the church looks. People stood in church in the early Middle Ages. By the 15th century most churches seem to have had seating. Pews or benches have remained until today ... Although now some are being removed and replaced with chairs. Philip: I do understand the notion of AMDG. I dare say that many builders of churches in America have had just that aim. I honor their intention, but think that their achievement usually falls short. "Inoffensive" is about the best I can say for the exterior of most American churches, though quite a few have handsome interiors. Anonymous: Some at least of the Orthodox still stand throughout the liturgy--at the Russian Orthodox cathedral around the corner from us they do. On the other hand, the custom of holding a lit candle must make for lower density. George. Speaking as someone who lives in Leicestershire I can tell you that the rural population reached its peak in the middle of the Nineteenth Century, Thereafter it gradually declined as people moved to towns and cities which offered better employment opportunities. This shift in population required new churches to be built in towns and cities to accommodate the growing populations. Many of these churches built in the inner city are no longer required as the population they were built no longer exists so the buildings are being converted to housing, commercial use or by different religious groups. Unlike the churches of Somerset, in Leicestershire and Northamptonshire many of the church towers are surmounted by a spire, which has no practical purpose. They do attract the eye across the countryside and are an expression of the faith and commitment of the community in the past. The tower may draw attention away from some of the other aspects of the building: a Norman-style buttress appears to cover up quoins of large stones in the Anglo-Saxon manner. If this corner was Anglo-Saxon, it was a mighty big building even at that time, and one wonders why so little pre-Conquest work has been noted for Somerset as compared with e.g. North Norfolk, although building stone in Somerset must have been fairly plentiful.The carefully-researched church guide mentions Anglo-Saxon stones reused by the Norman builders, and the village is mentioned in Alfred the Great's will, 901.